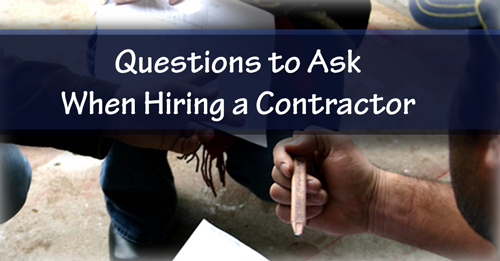 Hiring a Contractor Interview each contractor you’re considering. Here are some questions to ask. Are you licensed and registered with the state? Many states, but not all, require contractors to be licensed or bonded. Check with your local building department or consumer protection agency to find out the licensing requirements in your area. The licensing can range from simple registration to a detailed qualification process. Also, the licensing requirements in one locality may be different from the requirements in the rest of the state. If your state or locality has licensing laws, ask to see the contractor’s license. Make sure it’s current. Will you be using subcontractors on this project? If yes, ask to meet them, and make sure they have current insurance coverage and licenses, if required. Also ask them if they were paid on time by this contractor. A “mechanic’s lien” could be placed on your home if your contractor fails to pay the subcontractors and suppliers on your project. That means the subcontractors and suppliers could go to court to force you to sell your home to satisfy their unpaid bills from your project. Protect yourself by asking the contractor, and every subcontractor and supplier, for a lien release or lien waiver.